I am missing the German breakfast, it was my favorite meal everyday while we were there. I overheard one German animatedly telling his American friends that the particular hotel we stayed at had the best breakfast in all of Germany, and while it was the only breakfast I had, I certainly agree. One million times better than any hotel breakfast I’ve had in the U.S. So much good bread, pretzels, croissants, meats, cheeses, fruit and yogurt. Plus, we ate it al fresco in the prettiest sunshine. Definitely one of the things I’m missing the most. These Danishes don’t quite compare, but they are a pretty good make-at-home substitute when craving a elegant breakfast. We had a church ladies brunch a few weeks ago and everyone could bring food to share. There is always way more food than we could eat, but everyone loves to bring something. 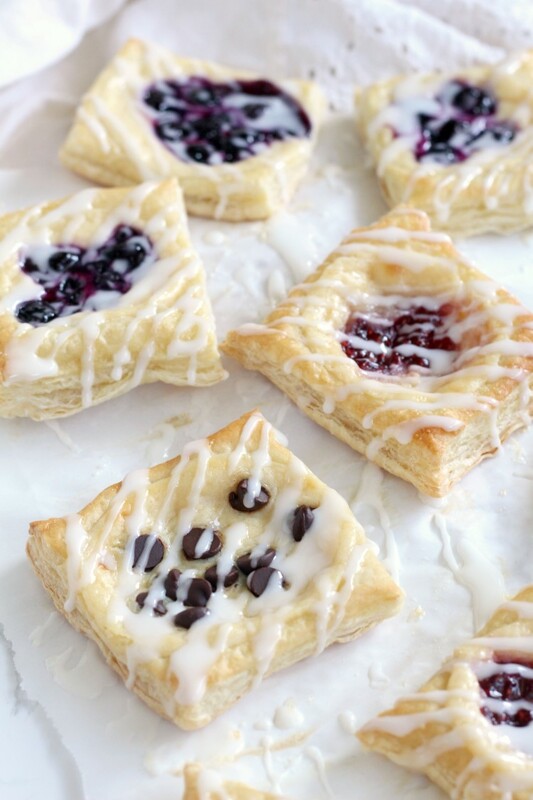 I made these little Puff Pastry Danishes because I was dying to make something with puff pastry. It’s so easy and fun to work with and then to see it magically puff up in the oven. And if you’re wondering, no I don’t make my own puff pastry. The frozen stuff is just too convenient. It would be a fun skill to master sometime, but with two little children, now is not the right stage of life. Above is a little step-by-step photo showing how easy they are. 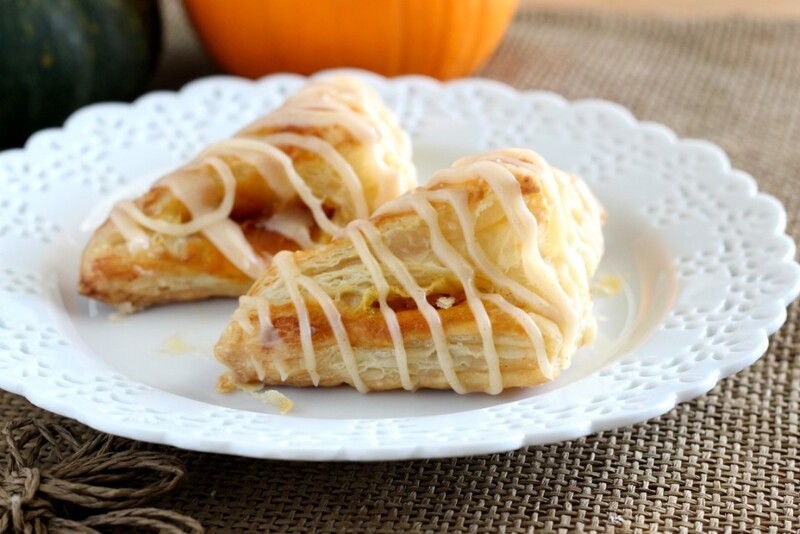 Simply, spread with cream cheese and filling, bake and drizzle with glaze. They are best enjoyed the same day they are made, otherwise they start to get a bit stale, so keep that in mind when making them. I would prep all the filling ingredients before and then just assemble and bake them the day you want them. They are still good, they just don’t have the same crispness after the first day. If you make them, let me know what filling you tried. Chocolate chip was my favorite, because I love chocolate, but raspberry was my second favorite. For the blueberry ones, I used some homemade blueberry pie filling, but it was a tad too runny. Stick to using jam or jelly for the filling. Apricots are one of my favorite fruit, so I’m thinking I would like to try an apricot version next. 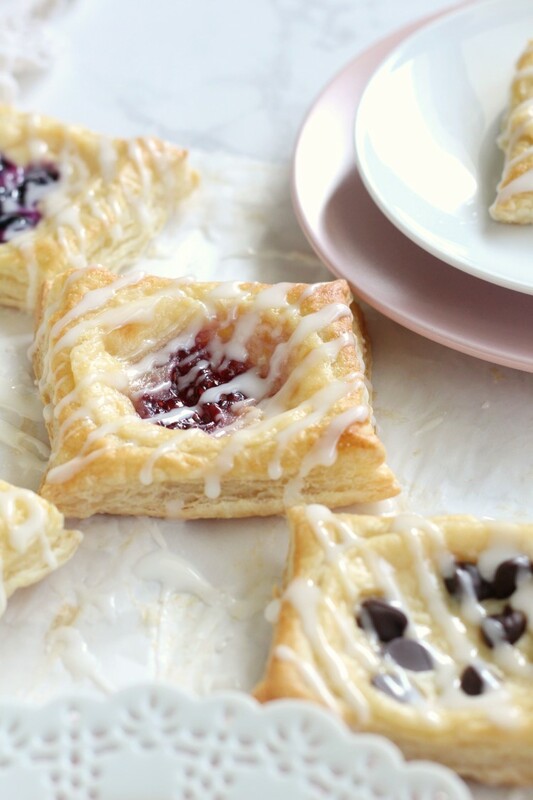 Try these easy danishes made from puff pastry. You can make them any flavor you want, chocolate, raspberry, blueberry. It's a quick and easy dessert recipe for brunch. Prepare the filling. Beat the cream cheese and sugar in a medium bowl until smooth. Beat in the egg yolk, lemon juice and vanilla until combined. Set aside. You will have a bit of filling left over, you can decide what to do with it or only make 2/3 of a batch if math is your thing. Preheat the oven to 400 F. Line 2 baking sheets with parchment paper. 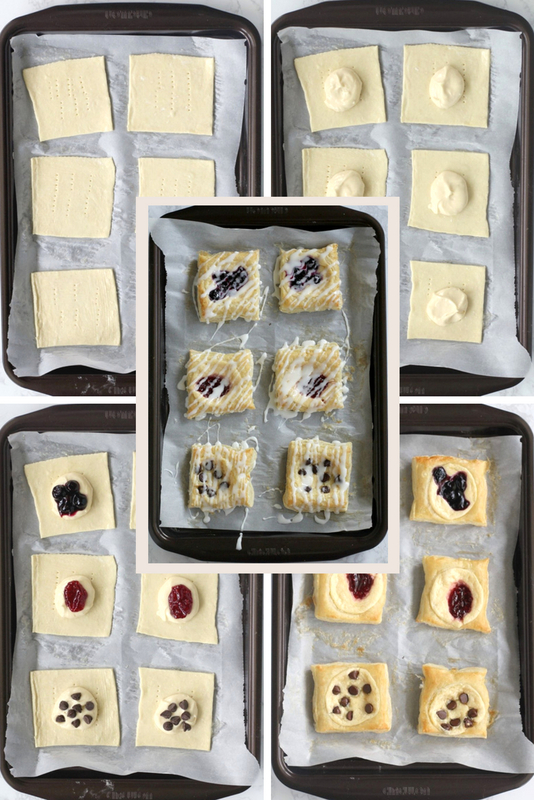 Roll each puff pastry sheet into a 12 x 12 inch square. Cut each into 9 pieces. Prick with a fork several times in the center. Beat the egg white and water together and brush onto each puff pastry square. 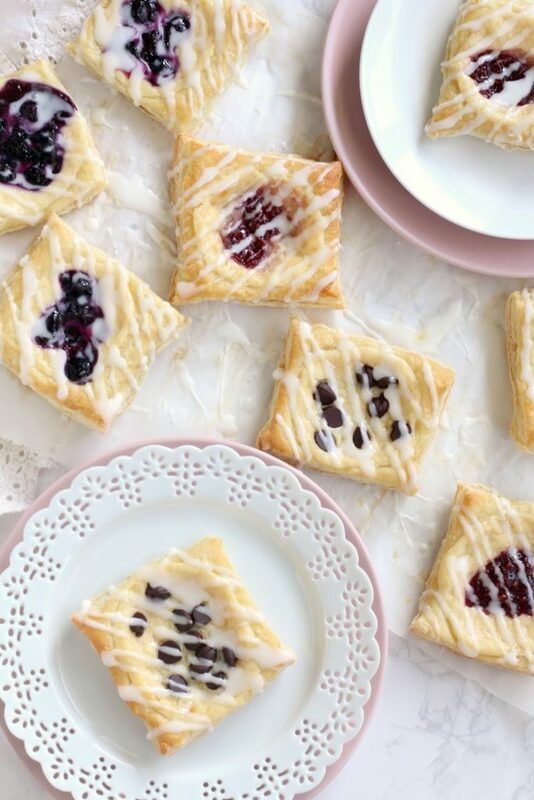 Place a scant tablespoon of cream cheese filling onto each square and then a teaspoon of your choice of jam, jelly or chocolate chips. Bake at 400 F for 15-18 minutes or until puffy and lightly browned. Cool on wire racks. Make the glaze by beating the powdered sugar with enough milk until smooth. 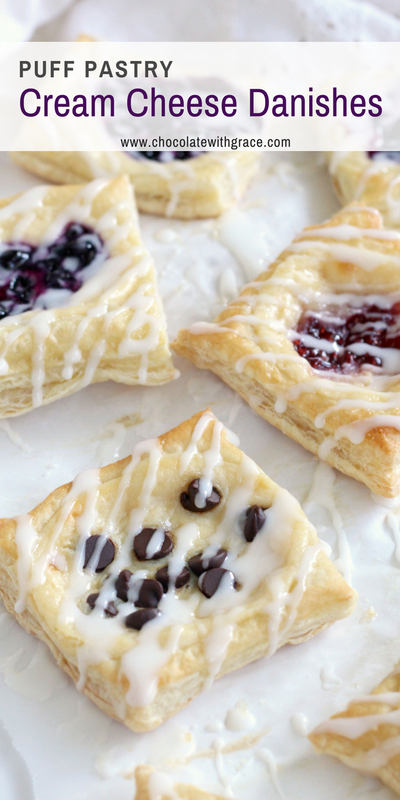 Drizzle on cooled Danishes. Best served the same day. Or store tightly covered for up to several days. Nutella sounds amazing in a puff pastry Danish. Try this Nutella Version from Let the Baking Begin. 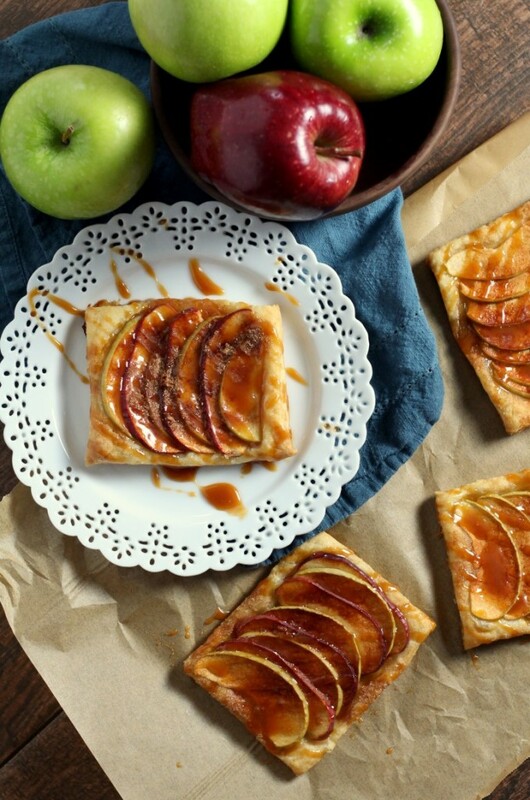 And here are a few recipes from my own site that use puff pastry. These are a family favorite in my house! I get requests to make them all the time! Having freshly made cheese danishes sure beats anything you can buy in a store. No one believed I made these myself! They thought I bought them at a bakery. 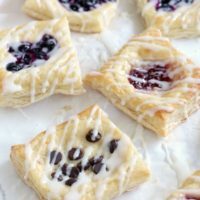 I love anything made with puff pastry, It adds such a buttery deliciousness to anything its made with. 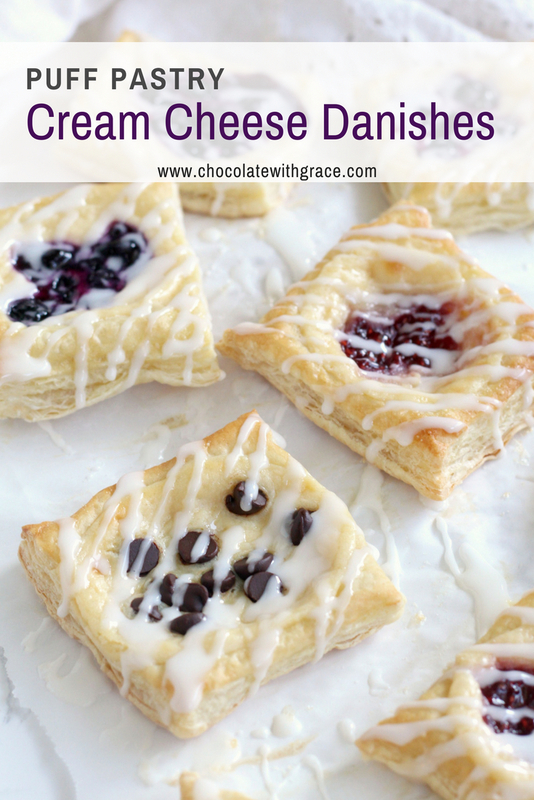 These pastries are a hit with me and I love their individual portioned sizes! So easy and so good. LOVE to keep the ingredients on hand to make these on weekends.